Rhubarb is currently in season and a fabulous ingredient so versatile in the kitchen, that it can be used with sweet or savoury dishes. Since we are just coming into spring, which for us Brits normally means further weeks of miserable, cold weather, a rhubarb crumble is the perfect dish. It is warming, comforting and one of the most traditional rhubarb dishes you can make. Cut the rhubarb into long pieces and place on an oven tray, sprinkle with the water and caster sugar and roast in the oven for 10 minutes. When cooked, remove from the oven, sprinkle over the ginger and mix well. Fill an ovenproof dish about 2.5 centimetres deep with the rhubarb. Rub the butter into the flour and demerara sugar to make the crumble topping. 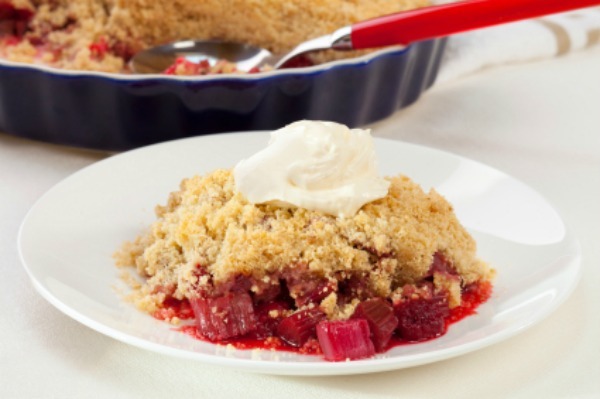 Sprinkle over the rhubarb and bake in the oven for 35–45 minutes, or until the crumble topping is crisp and golden brown. Remove and allow to cool slightly before serving with double cream.